With over a million documented species, insects are the most successful group of organisms from the perspective of biodiversity. In the course of their evolution, they have developed a giant arsenal of active ingredients and enzymes, which they use to defend themselves against enemies and disease or to explore novel sources for nutrition. 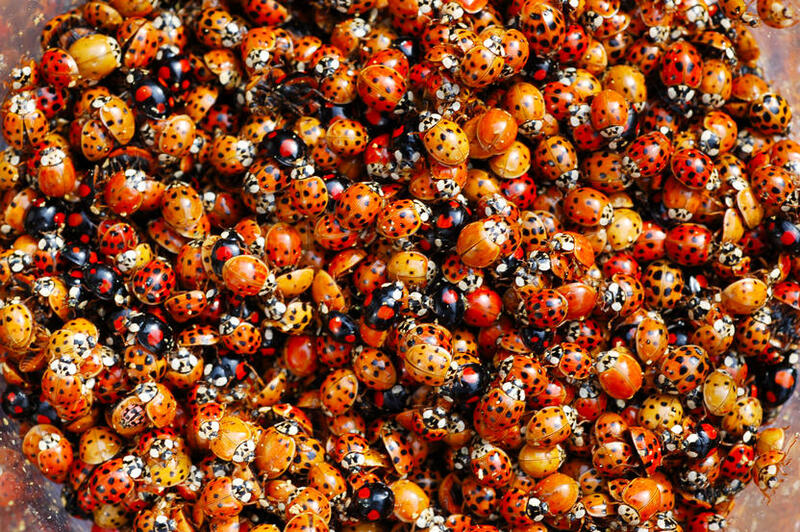 Making this enormous repository of natural substances available to the bioeconomy is the core task of insect biotechnology, which is now starting to become known as "Yellow Biotechnology". What do we mean by “insect biotechnology”? Most people have a rather less than positive opinion of insects. Measured by the tonnage of foodstuffs that they destroy in the field or in the warehouse, insects are our greatest co-competitor for food sources. And every year, millions of people around the world also die of diseases that are transmitted by insects – such as malaria. In light of these facts, applied entomology tends to concentrate most of its research efforts on the development of strategies focused on the control and containment of insects as pests. In the future, however, the development of innovative, biotechnological methods will enable not only the sustainable and ecofriendly control of insect pests and vectors but also the utilization of insects as suppliers of active ingredients for the bioeconomy. Insects also harbor considerable potential for use as bioconverters of biological waste. We define insect biotechnology as the application of biotechnological methods for the purposes of exploiting insects – or insect-derived molecules, cells, organs or microorganisms – as products for applications in the fields of medicine, plant protection or manufacturing. Increasingly referred to as “yellow” biotechnology, this emerging field is oriented on the development of new technological approaches along the value chain. The field therefore has considerable economic potential and is accordingly a key driver in the utilization of biodiversity for the bioeconomy [1 – 3]. Within both Germany and Europe as a whole, the largest unit now in operation is the LOEWE Center for Insect Biotechnology and Bioresources, which is based at the Justus Liebig University Giessen and Mittelhessen University of Applied Sciences (THM). The obvious biodiversity of insects as a class of species is also encountered again at the biochemical and molecular levels. Insects and their associated micro­organisms produce an incredible variety of active ingredients whose exploitation for the good of humanity is now being actively pursued. Nor does insect biotechno­logy restrict itself to pure research on natural substances, since these active ingredients can be marketed only if they can be cost-effectively manufactured in sufficiently large quantities. While peptides or proteins produced by insects or their symbiont microbes can be manufactured as synthetic or recombinant analogs, enzymes or peptides synthesized by insects commonly exhibit complex folding or post-translation modifications. 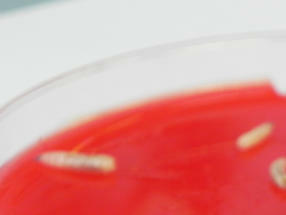 Accordingly, the substances cannot be expressed in this form by bacteria or yeasts. Due to this problem, expression systems based on insect cells are very much in vogue, offering a number of advantages even in comparison to vertebrate cell lines. The development of cost-effective fermenter technologies based on insect cells is a bioengineering challenge that is being successfully studied and overcome by researchers working at the LOEWE Center for Insect Biotechnology and Bioresources. Many substances that are produced by insects or their microbial symbionts are interesting in terms of their potential for use in medical applications. As one example, larvae of the common green bottle fly Lucilia sericata (Figs. 1a and 1b) are used in many cultures for traditional medicine, and the recently-approved maggot therapy is in many places not just used for the treatment of chronic or non-healing wounds, but is also deployed as a treatment for disorders such as diabetic foot syndrome. The occasionally spectacular results of such treatments are due to the active substances produced and secreted into wounds by the larvae. These substances not only disinfect the wound and accelerate its healing, but are also capable of digesting necrotic tissue while leaving healthy tissue unharmed. 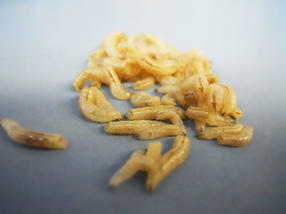 The use of maggots for wound therapy is not always welcomed by patients, and any larvae that manage to escape can develop into flies, which then proceed to spread disease in the hospital. Fig. 3 H. axyridis has enormous antibacterial potential. 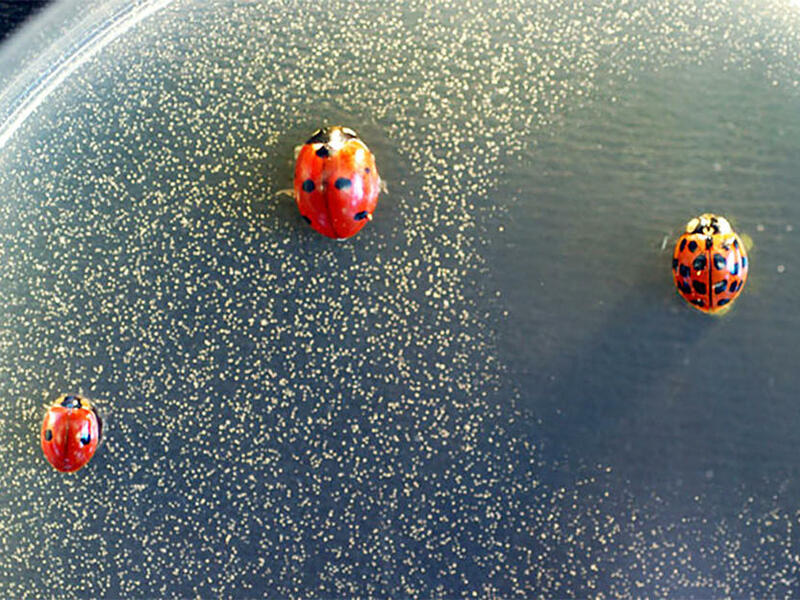 As can be seen from this Petri dish inoculated with coliform bacteria, the bacteria are killed off in the presence of H. axyridis, yet only a small or non-existent inhibition zone surrounds the native ladybird species Coccinella septempunctata and Adalia bipunctata. The translational approach in insect biotechnology has the aim of identifying as many of the therapeutically-­active molecules contained within larval secretions as possible. Once manufactured as synthetic or recombinant analogs, these can then be included as ingredients in hydrogels, for example, and marketed as ointments that promote healing. Recent research has also shown that the antimicrobial peptides produced by maggots can occasionally have a synergistic effect against human pathogenic bacteria. Combination therapy with antimicrobial peptides exhibiting this synergistic effect can drastically reduce the quantities required for treatment . In terms of antimicrobial molecules, insects exhibit by far the greatest diversity. 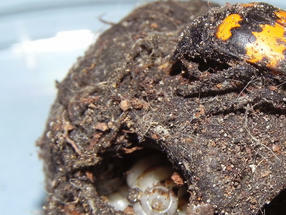 The current title holder in this respect is the harlequin ladybird Harmonia axyridis (Figs. 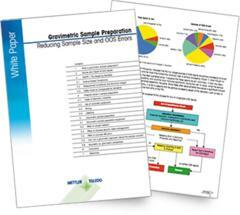 2 and 3), in which over 50 genes have been discovered that code for antimicrobial peptides. No other organism has beaten this record to date . Current research work is also focusing on smaller molecules, however, which are suitable for use as lead substances in the development of new antibiotics. One example is harmonin (Fig. 4): developed from the harlequin ladybird, it shows activity against tuberculosis and malaria pathogens. . The development of such substances into new antibiotics is both a costly and high-risk undertaking, however. Accordingly, the insect biotechnologists at Giessen work closely with industrial partners such as Sanofi in the development of insect-based antibiotics. In the course of their evolution, insects have acquired the ability to use almost any organic substrate – from tree trunks to dead animals – as a food source. Some of the specialized enzymes insects have developed as a result are used in the bioconversion of organic waste and hence of interest to the bioeconomy. 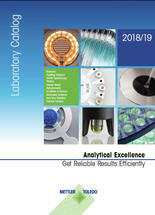 The targeted search we conduct for new enzymes of interest for applications in industrial biotechnology is guided by knowledge-based approaches. Accordingly, our research unit in Giessen not only investigates why clothes moths can eat and digest clothing but also how the ability of black soldier fly (Hermetia illucens) larvae to convert slurry, old fryer grease or silage waste into fats and protein could be used in the future as a food source for fish farming, for example. One especially impressive example from the targeted search for new enzymes is offered by the common sexton beetle Nicrophorus vespilloides (Fig. 5). 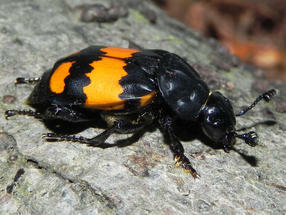 This beetle buries the corpses of small mammals or birds (which it can locate at a distance of several miles) in soil as a food source for the beetle and its young (Fig. 6). In the process, the beetle not only manages to chemically preserve  a carcass several hundred times its own weight, but also effectively digests the entire animal outside its own body. This means the sexton beetle must secrete enzymes that could be utilized in the bioconversion of slaughterhouse waste, for example. products than mere honey and silk. For this reason, insect biotechnology not only has huge economic potential but is also projected to enjoy considerable growth. In Asian countries such as China, Japan and South Korea in particular, huge sums are now being invested in the utilization of biodiversity for the bio­economy. 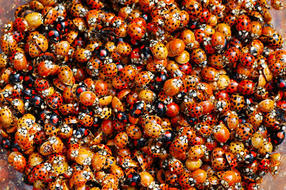 And the recognition that insects are not merely pollinators but an increasingly important repository of natural substances is sure to improve their reputation with the general public. First publication: Vilcinskas, A., q&more, 2.2015.